Congress wants to pull billions out of the Federal Reserve. Lawmakers are trying to pass a $325 billion highway bill to fix America's crumbling roads and bridges. And Congress wants part of the funds to come from the Fed's emergency stash of money. In fact, Congress wants to take the $29 billion from the Fed and close the account for good too. The Fed created this "surplus account," shortly after it began operating in 1914. The idea was that it would serve as a cushion to absorb any potential losses the Fed incurs. However, many members of Congress believe that the Fed doesn't need the money any more and should be put to better use. "It is appropriate to liquidate [the Fed's surplus] account to meet today's realities," Randy Neugebauer, a Republican Congressman from Texas, told the House earlier in November. The House agreed, and overwhelmingly voted to include the Fed's billions in the highway bill. However, some believe the move to dip into the Fed's cash is politically motivated and is just the latest in a series of salvos against the Fed from members of Congress. 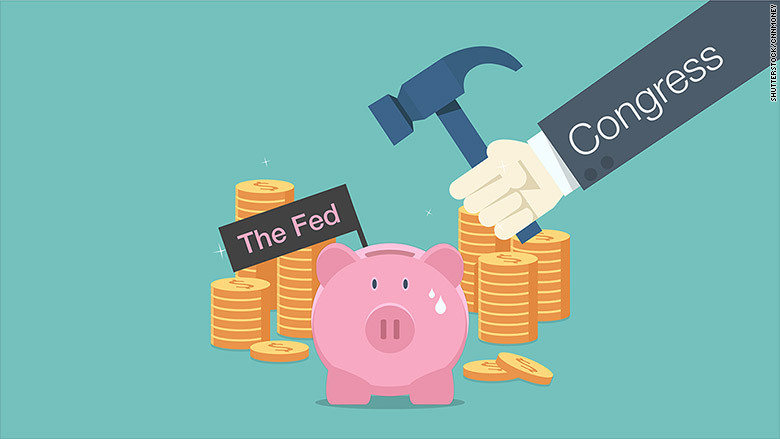 The Fed doesn't want to look like Congress' bank account. "To the extent that they're seen as a piggy bank, [that image] threatens them," says David Wessel, director of the Hutchins Center on Fiscal and Monetary Policy at the Brookings Institution. The Fed has already been threatened by Congress this year. Republican presidential candidates Rand Paul and Ted Cruz have been very vocal in calling for an "audit" of the Fed, even though the central bank is already audited twice a year by an independent auditor and the Government Accountability Office, which is a part of Congress. And last week, two Republicans proposed a bill that would require the Fed to operate its monetary policy based on a defined rule -- something the Fed believes would hamper its ability to act during times of crises. Fed officials say all of these actions, including Congress reaching into its piggy bank, jeopardizes the Fed's independence from politics. "Using a central bank as a source of revenue to cover the cost of a fiscal program is dangerous to its independence," Fed Vice Chair Stanley Fischer said earlier in November. Given the recent financial crisis and the Fed's actions to support and stimulate the U.S. economy, the central bank currently holds over $4 trillion of assets. It would seem like the Fed needs a cushion against potential losses now more than ever. But the odds are low that the Fed would need to use this particular fund to absorb any losses, experts say. The Fed can just sell other securities in its portfolio to make up for any losses. However, if Congress does take the Fed's billions and closes the account, it could potentially create a situation in the future when the Fed might actually be staring at a loss with no other option but to ask Congress for cash. Many believe that scenario creates a conflict of interest for the Federal Reserve, which should have the independence to set monetary policy without any political pressure. No matter what happens, the highway bill has urgency -- Democrats and Republicans agree that America's highways need to be maintained and improved. It could be a boon for construction jobs too. Currently there's only enough funding until Dec. 4 to spend on highways. That's the same day Congress is slated to vote on the bill, which will be funded for six years. But at the end of the day, taking the $29 billion just doesn't set a good precedent, argues former Fed chair Ben Bernanke. "It's not good optics or good precedent for Congress to be seen as raiding the supposedly independent central bank to pay for spending," Bernanke wrote in a blog post.